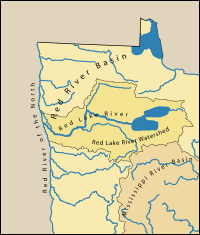 The Red Lake Watershed District is the regional governmental unit responsible for managing and protecting the water resources of the Red Lake River watershed, 5,990 square miles that includes all or part of ten Minnesota counties. The District was established in 1970 under the Minnesota Watershed District Act, Minnesota Statutes Chapter 103D. For more information about the watershed you live in click here. The jurisdiction of the Red Lake Watershed District includes land that flows into the Red Lake River and Grand Marais Creek. 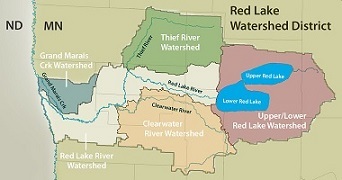 The map highlights the area that is encompassed by the Red Lake Watershed District and how the drainage area of the district is split into five major subwatersheds: Upper/Lower Red Lakes, Thief River, Clearwater River, Red Lake River, and Grand Marais Creek. Learn about the watershed you live in by clicking here and exploring the pages that were developed for each major subwatershed located within the RLWD. Each link will take you to a comprehensive compilation of information about each watershed including reports and photos. 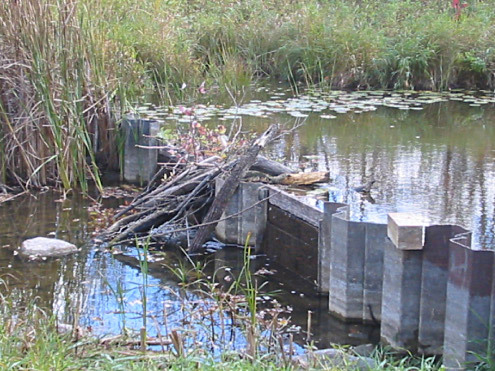 Red Lake Watershed district has 3 current project work teams; Four-Legged Lake Flood Damage Reduction Project, Pine Lake Area Improvement, and Black River Impoundment Project. For more information about Four-Legged Lake FDR click here. For more informtaion about Pine Lake Area Improvement Project click here. For more informtaion about the Black River Impoundment Project click here. Red Lake Watershed District projects are designed to address specific problems within the Red Lake Watershed and to implement strategies and policies approved and set forth by the Board of Managers. The Red Lake Watershed District Water Quality Program is a regional and statewide leader in establishing quality control standards for sample collection and data management. In coordination with other agencies, it also participates in numerous investigative studies, training programs, and public education events. Click here for a PDF of the Red River Basin Standard Operating Procedures. The Watershed District office building is located at 1000 Pennington Avenue South in Thief River Falls, Minnesota, 56701. Our phone number is 218-681-5800.